Ever wondered what angels do all day? How they suddenly appear from nowhere in your time of need? Read here for more information on the nature of angels. They are truly amazing beings! Angels are made of pure spirit, not flesh and blood. They feel nothing but love and care for humans, and enjoy helping them. They will protect humans against dangers in the universe, like a parent or concerned lover or friend. There are millions of them in the universe. They can sometimes take on a human-like form, often so they can appear to us in a way our minds can comprehend. However, this is not their original form, as they don’t have a form. Nor do they die – they exist forever once they are created. A common question put to us at Angel Reach is what angels do when they are not going about their normal business of helping, comforting, worshipping, and guiding. Don’t they get bored, as they exist forever? It’s not that simple. Angels don’t get bored because you need to be mortal to become ‘bored’. We become ‘bored’ because we have reached the limits of what we can usefully learn from a situation - angels don’t have limits on their understanding like we do. They are permanently experiencing new things they have never experienced before, and can also move through time – only beings which exist in ‘space’ experience time as linear. Mind-bending stuff! When angels aren’t carrying out their normal business, they seem to spend their ‘time’ having insights, and studying humans. As humans are never-ending subjects, with lots of secrets yet to be discovered, and not finite objects, angels never get bored of them. Their great intellect means they are constantly finding out new things about humans, which they can then use to help them. 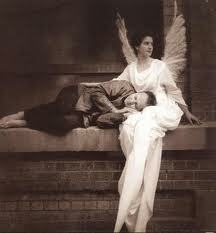 Angels don’t need to sleep either, as they are spirits – there is no night and day to them. Night and day belongs to humans and animals. How do Angels communicate with each other? Angels don’t have senses, like you and I. They don’t hear or speak like us. They therefore use mental telepathy with each other. Whereas we work things out logically, step-by-step, from what another human is telling us, angels know everything other angels are trying to communicate straight away. So if you were listening to a story someone was telling you, you would hear it step by step, gradually unfolding. With angels, they would know it all in what would be a split second in human time - there is no need for them to gradually 'build' a story from what they are being told. Everything is sent straight to their minds. Often, they work behind the scenes, to help us or leave us clues. When they do communicate with us, it’s usually by suggesting things to our imagination, and inspiring us. However, they would never seek to override our freewill – they can give us ideas and messages, but what we do with them is up to us. Sometimes we just ‘know’ things, which is usually an angel communicating through mental telepathy. If we do hear an actual angel voice, it is normally because our minds are translating their messages into a form we can understand. Their ‘voices’ are our own mind’s translation system, not their real voices. Not in space. Space is for bodies, and angels don’t have bodies. They exist in a parallel dimension, though often cross over in some form to help us, or talk to us. They are around us all the time, but we can’t always see them. They can also come and go instantly – they don’t need to travel through space to get somewhere, like we would. They can be anywhere they want, at any point in time. They are often called to a human in need by other angels. Is it possible to have more than one Guardian Angel?